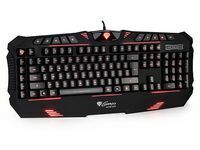 Natec Genesis R33 is a gaming keyboard is made for players, who are looking for a device with good quality and reasonable price. Despite the small price, it still has all the basic features that are essential for gamers. This is an extremely durable device dedicated for those who pay attention into strength and easiness of use. Genesis R33 has very good quality of membrane keys, therefore is great for gaming. 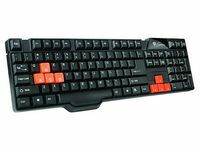 Most of typical, office keyboards have poor quality keys, and that makes then not suitable for gaming. Thats why R33 uses high quality membranes, with long life its perfect for intense gaming! 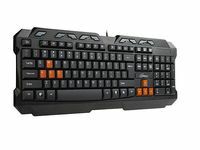 Classic keys shape make the keyboard easy and quick to use, and classical keyboard setup should be appreciated by all fans of PC gaming. Natec Genesis R33 has 9 multimedia keys, which gives you easy access to multimedia functions on your PC. Without any problem, you can turn your computer to the center of home entertainment. Opening your favorite music player or controlling volume level, are just some of the features. With R33, using your computer as media center is easy like never before! Special, draining holes at the bottom of the keyboard protect it from any water splash damage. Its obvious for every active gamer, that WASD and arrows keys are used frequently in gaming hence the included 8, additional keycaps for these keys. Rubberized surface and embossed inscriptions give longer life to the keys and substantially increases comfort of playing. Stable construction and good quality materials, and gold-plated USB connector are making the device durable and solid.